First of all excuse the long title. My true title for this project is “Gettin’ Dirty” cus its not a clean one….hehehe. So, my first non-coerced reader, Rebecca, introduced me to an online paper crafting challenge called “Mojo Monday,” this is where the layout from this design is from. When I saw the sketch I knew it had potential….and not wanting to copy anyone else this time I ended up just sitting and staring at the layout sketch trying to figure out just where to start. After awhile I sat it down to get some other work done….In the meantime I ran accross another weekly challenge called “Curtain Call Color Challenge” and from the combination of these two challenges comes my card “Gettin’ Dirty”. Combining the two challenges really did make it easier to get started….I already knew my basic layout, and I knew what colors I would be using, so now all I had to do was fill in the blanks. The Color Challenge Colors were: Basic Black, Pumpkin Pie, Whisper White, Kraft, and Pink Pirouette. Of course I immediately thought how the heck am I going to get this BOLD pumpkin pie to mesh with my more subtle pink, white, and kraft???? Then ding, ding, ding…..this is where the “Gettin’ Dirty” party comes in……DISTRESS the heck out of everything!!! While I’m not totally in love with the outcome I do appreciate it….This challenge pushed me to use colors together that I normally wouldn’t. While it’s not likely I will be pairing Pumpkin Pie and Pink Pirouette again in the near future, it does open my eyes to experimenting more with non-traditional color pairing. 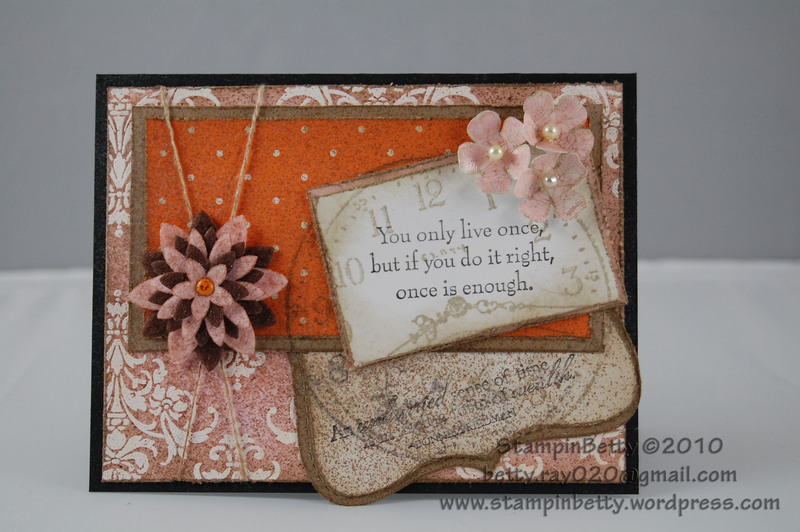 Remember you can always click my shopping links (like HERE) to open my Stampin’ UP! shop in a separate window and get all the Stampin’ UP! Supplies needed to complete this project. I try my best to list the item numbers below to help speed up your shopping. All you need to do is enter the item # into the “Search” box on the left side of the Stampin’ UP! Screen. Your purchases help fund this crazy adventure I have taken to complete 365 Stampin’ UP! Projects in 365 days. If you are interested in the Mojo Monday Challenge it can be found by clicking on the below picture of the Layout for this challenge. More info on the Curtain Call Color Challenge Can be found by clicking on the below picture of this week’s color challenge. Hope this helps spark your own creativity. Please leave comments whether good, or about how to improve my work……as I am still a “newby” so I can use all the help I can get! !